Content provided by Rui Wang, CLS Investment/Research Analyst It has been a very good run for CLS International Rotation Quad portfolio so far this year. At the end of April, CLS International Rotation Quad gained 2.97% since its inception on October 30, 2012, outperforming its benchmark (MSCI ACWI ex U.S. index) by over 100 basis points. The biggest contributor to the outperformance is the allocation in European stocks. 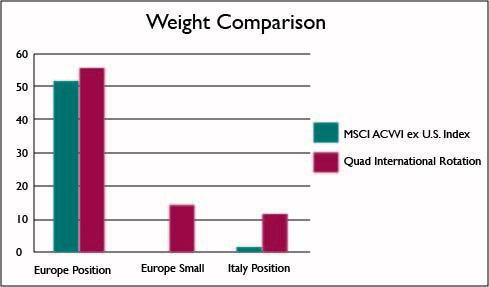 As the chart shows, the International Rotation Quad has been overweighting Europe by about 5% relative to its benchmark. 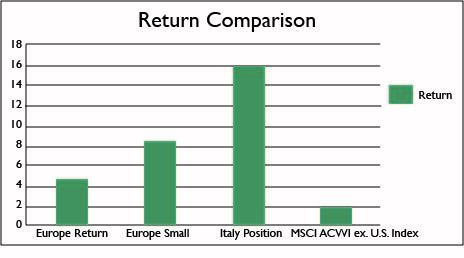 It is also worth noting that within the European allocations, the overweight to Italy and small cap stocks has provided clients a great deal of alpha. 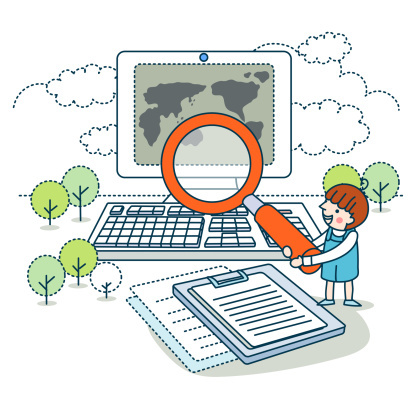 The only trade CLS managers made for the International Rotation Quad so far this year was to reallocate a portion of Emerging Markets to Developed Asia.